NETWORK FINALS: On both CBS and NBC, the 8PM shows (the season finales of BIG BROTHER and AMERICA’S GOT TALENT) gained 0.1 in final numbers at the expense of the 10PM lead-outs (the season finale of SALVATION and the season premiere of THE GOOD PLACE). In addition, the 8PM hour of MASTERCHEF rose 0.1. CABLE HIGHLIGHTS: USA’s THE SINNER cemented its place as the low-key phenom of the summer TV season, zooming 0.23 for a terrific 0.77 season finale rating. On Comedy Central, SOUTH PARK fell 0.27 from last week’s season premiere to 0.69, and BROAD CITY was down 0.18 to 0.33, still enough punch to keep THE DAILY SHOW in the Top 10 for the night at 0.34. MTV’s TEEN MOM aired an off-night episode at 0.54, as lead-in to ARE YOU THE ONE at 0.26. OWN’s GREENLEAF gained 0.06 to 0.41. On Discovery, GARAGE REHAB grew by 0.05 to 0.35, and MISFIT GARAGE was up 0.04 to 0.31. 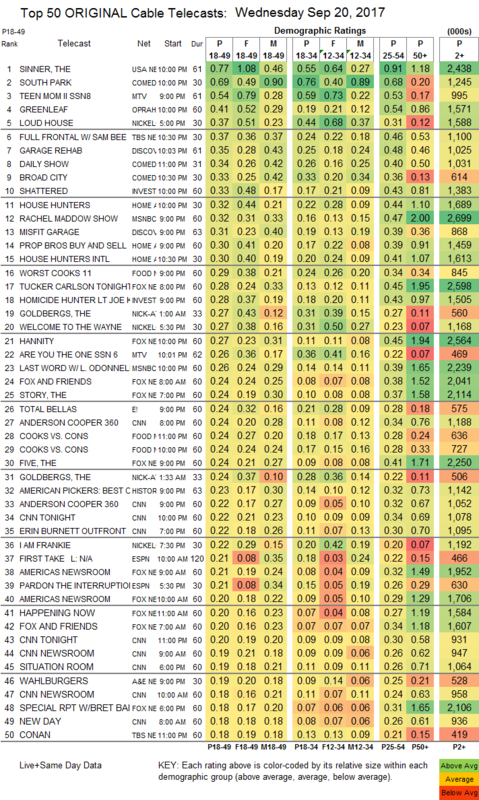 On ID, SHATTERED ticked down to 0.33, and HOMICIDE HUNTER was down 0.08 to 0.28. On HGTV, HOUSE HUNTERS dropped 0.05 to 0.32, HOUSE HUNTERS INTL lost 0.05 to 0.30, and PROPERTY BROS was down 0.11 to 0.30. Cable news was led again by MSNBC’s RACHEL MADDOW SHOW at 0.32/2.7M, above Fox News’s TUCKER CARLSON TONIGHT at 0.27/2.6M, and CNN’s ANDERSON COOPER 360 at 0.24/1.2M. 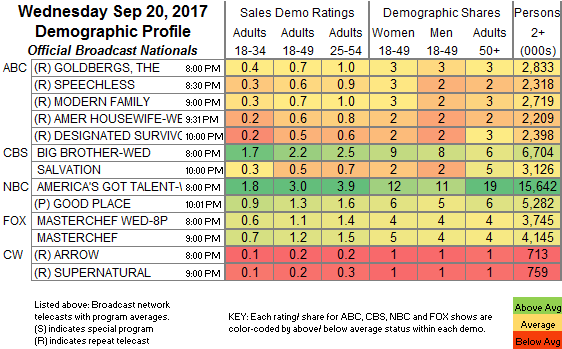 On Food Network, WORST COOKS IN AMERICA dropped 0.13 to 0.29, and COOKS VS CONS aired 2 episodes at 0.24/0.24, compared to last week’s 0.30. Nickelodeon’s 5:30PM WELCOME TO THE WAYNE just made it into the Top 20 at 0.27. On E!, TOTAL BELLAS was steady at 0.24, while ERIC & JESSIE: GAME ON fell 0.13 to 0.15. On A&E, the season finale of WAHLBURGERS was at 0.19/0.17, compared to last week’s 0.27/0.27, and THE LOWE FILES was down 0.02 to 0.13. FXX’s YOU’RE THE WORST rose 0.04 to 0.14. Tru’s COMEDY KNOCKOUT plunged to 0.14/0.09 from last week’s 0.35. The season premiere of Syfy’s CHANNEL ZERO was at 0.13. Lifetime’s GROWING UP SUPERMODEL ticked down to 0.07. Off the chart, the season finale episodes of POP’s SWEDISH DICKS were at 0.02/89K and 0.01/52K compared to last week’s 0.02/96K, and IFC’s BARONESS VON SKETCH SHOW was up 0.01 to 0.03/68K.